Newcastle-based software giant Sage Group, the UK’s largest listed tech company, said on Thursday its group “organic” revenue increased 7.6% to £465 million for the first three months of its year as it continues to focus on subscriptions. Sage shares rose 6% on the news. In a trading update for the three months to December 31, 2018, Sage said “recurring” revenue increased 10.5% to £387 million, underpinned by software subscription growth of 27.7 % to £237 million. “Software and software related services (SSRS) revenue declined by 5.8% to £65m reflecting the managed decline in licences as the business transitions to subscription, offset by a slight increase in services,” said Sage. “Organic revenue growth of 7.6% reflects growth in products within, or to be migrated to, Sage Business Cloud of 9.3% to £380m and a slight increase of 0.6% to £85m in products with no current path to Sage Business Cloud. “Regionally, North America delivered revenue growth of 10.4% to £154m, with double digit recurring revenue driven by cloud connected solutions and Sage Intacct. “The UKI showed strong signs of recovery with revenue growth of 5.9% to £96m and double digit recurring revenue growth driven by Sage 50 cloud connected migrations. “In France, revenue growth of 5.8% to £69m reflects continuing recovery in recurring revenue, driven by Sage 200 cloud connected. 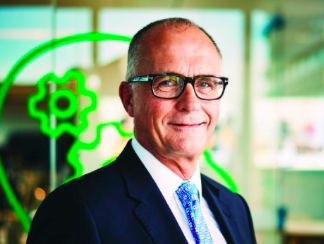 Sage CEO Steve Hare said: “We have been encouraged by the strong start to FY19, reflecting the renewed focus on high-quality subscription and recurring revenue as we continue the journey to becoming a great SaaS business.